We offer a range of standard scoreboards displaying the score and match time. These scoreboards are available with the LED digits ranging from 6 to 16 inches in height. Size examples are shown below alongside the prices in the table. The standard layouts and prices will satisfy most requirements, but we manufacture everything, so are very flexible with layout to accommodating the space or weather tight housing you may already have. The prices in the table include a scoreboard with a side mounted control panel, a mains power supply and power lead. It also includes either 2 handles, wall mounting brackets or threaded inserts, depending on how you choose to mount your scoreboard. All prices exclude delivery costs and VAT. There are three different controllers available for use with our scoreboards. 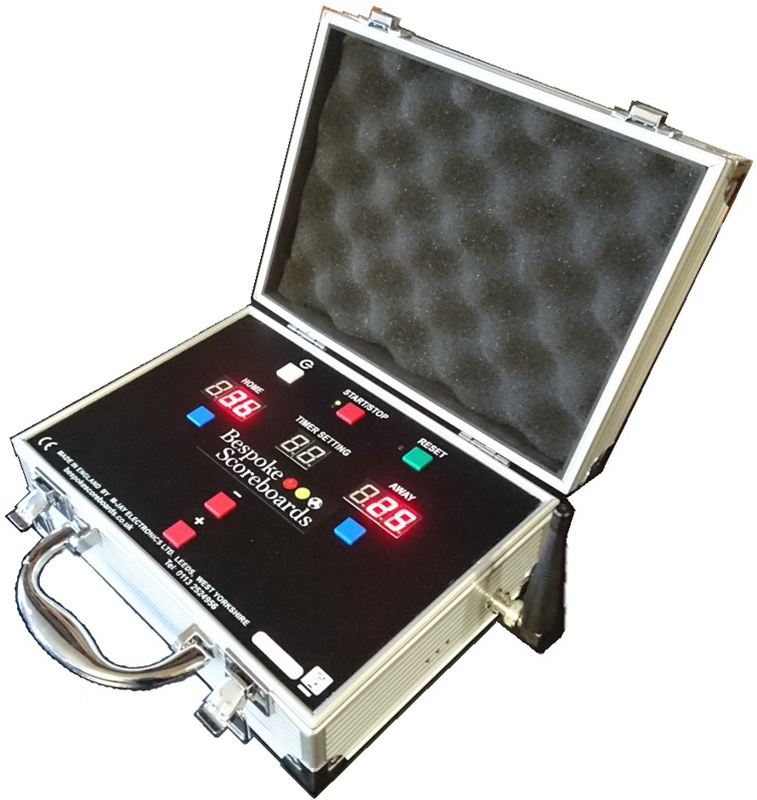 The side mounted control panel is simple to use to for setting the timer and adjusting the teams scores. If you want to be able to control the scoreboard without having to be next to it then choose one of our remote controllers, either wired or wireless. These controllers function in exactly the same way as the side mounted control panel, but as the remote controller will be operated away from the scoreboard the controllers have additional LED indicators to show if the timer is running or stopped and a display to help set the match timer. Choosing the wireless controller adds a radio transmitter, an internal battery and charging circuit to the controller. The range of the wireless transmission in optimal conditions is 400 metres, so the range will easily cover any rugby ground. The wired remote controller option costs an additional £114.00 to the prices in the table, whereas the wireless remote controller is an additional £322.00 to the prices in the table. 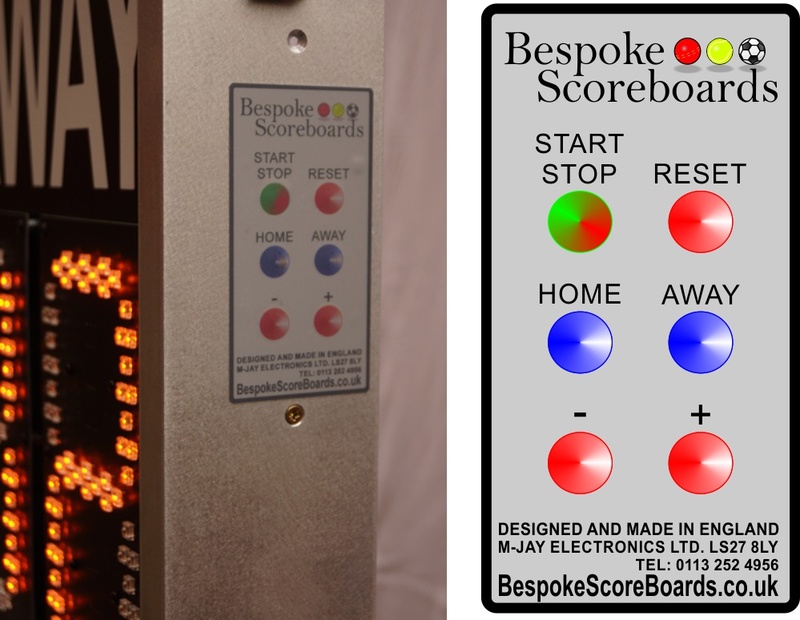 All our scoreboard operate at 12V, allowing them to be powered from a leisure battery (similar to a car battery) or from a 12V power supply (included in the price). 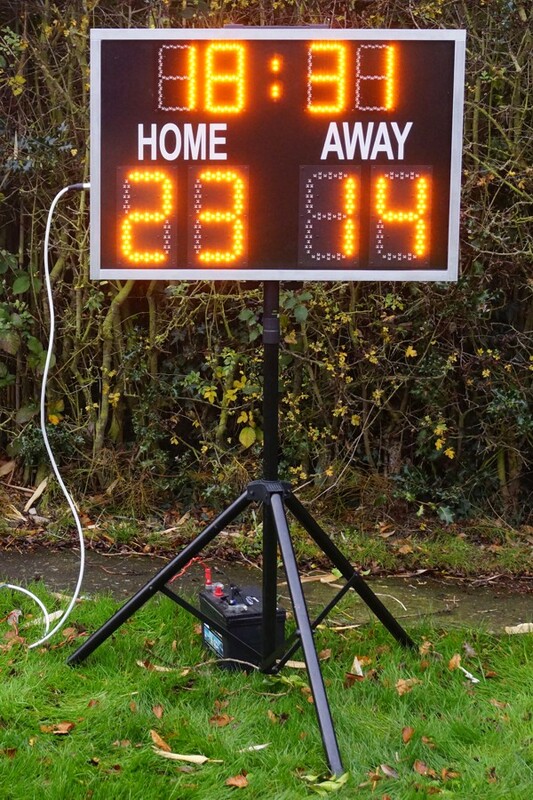 The advantage of being able to power the scoreboard from a battery means a smaller scoreboard can be taken to any sideline at any ground, but even for a permanent installation a battery is often used to power the scoreboard as it can mean a significant cost saving in infrastructure to get mains electric to the ideal location of your scoreboard. The cost of a battery includes an 80Ah leisure battery, battery terminals (for connecting the scoreboard power cable easily to the battery) a fused recharging cable and a larger power supply than standard for £105.